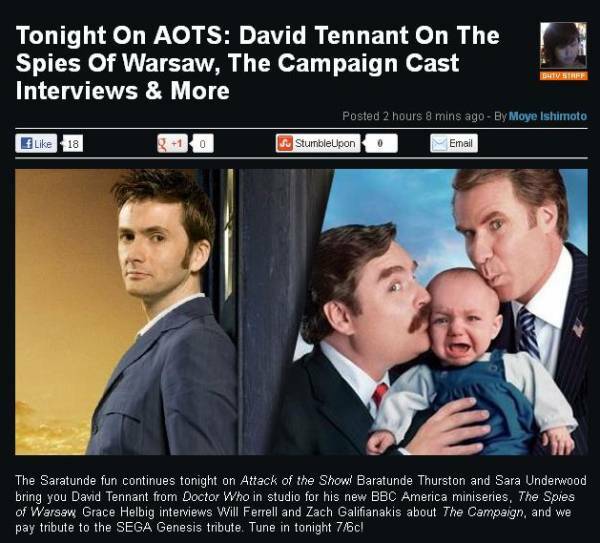 On Thursday 2nd August an interview with David Tennant was broadcast on the programme Attack On The Show. Attack Of The Show is geared towards the male viewers as the description on the G4TV website says "Welcome to TV's only source for all the stuff you care about from the coolest viral videos to the hottest new gadgets, comics and movies. Attack of the Show gets it before it gets out." Attack Of The Show was broadcast at 7pm ET on G4 in America (repeated at 2am) and at the same time on G4 TechTV in Canada. It can also be seen in Australia on the channel Fuel at 4.30pm the following day. A video of the full interview was posted onto the Attack Of The Show website afterwards for those outside the US. David's appearance appears to have been recorded on Wednesday 1st as he was wearing the same clothes as he did for his appearance at the Television Critics Association Summer Tour that day.